The first issue with the play was Keith pinching. It was understandable, given how aggressive the Blackhawks were early on, that he was attacking the puck. But he has to see Eager coming to lay the wood, and get out of the way. Nine times out of ten, Keith is nowhere to be found when Eager drops Leino like a bad habit. The second issue was with Kane. 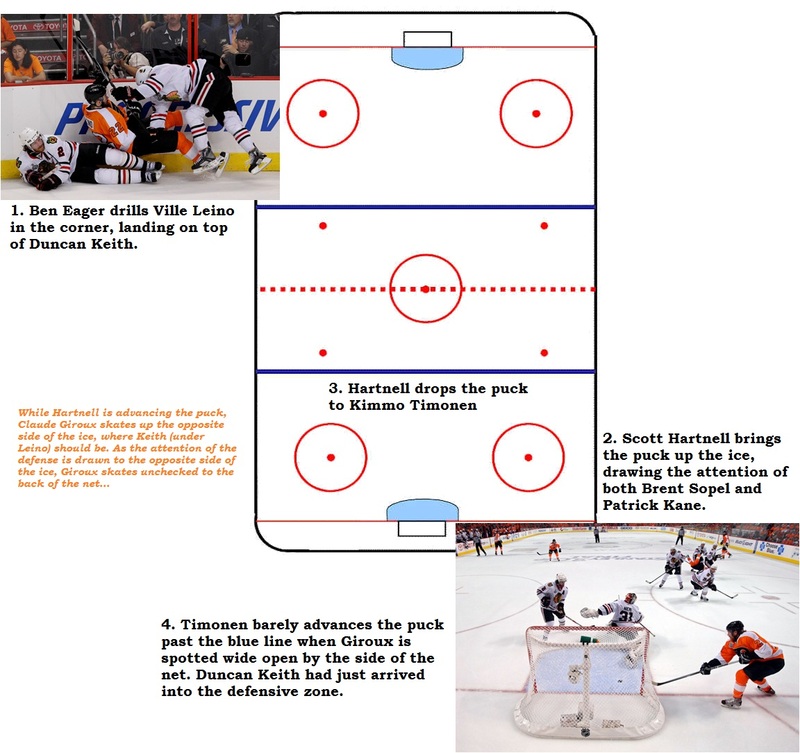 He pursued Hartnell along the boards instead of settling into the passing lane between Hartnell and Timonen, who was trailing the play. However, Kane was trying to make a play on the puck with a potential cherry-picker in Eager up the ice; a turnover could have been an odd-man rush for the Hawks. The third, and biggest, issue was Giroux skating up the back side of the play unchecked. While it’s understandable that, given how good Keith is about being where he’s supposed to be, the other Hawks on the ice would take him for granted, Jonathan Toews needed to put at least his eyes on Giroux. He assumed the front-side post defensive position in Keith’s absence and with Sopel battling Hartnell outside, but didn’t see Giroux. As Keith got to the net he stayed on the left side of Niemi, completely missing Giroux skating clean behind him and around the back of the net for a wide open opportunity. 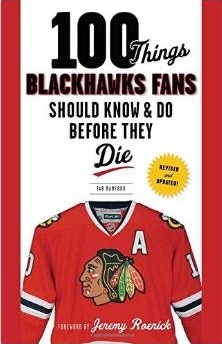 The final problem was the lack of a Blackhawks player in the passing lane from Timonen to Giroux. The Blackhawks only blocked 11 shots in Game Four, well below both their regular and post season averages. Toews was late getting down, and Eager played for the big hit on Timonen as he got back into the play. Timonen could have blasted an uncontested shot at Niemi from his position on the point, but opted to make the smart play and dump the puck to a wide-open Giroux. In either case, a Hawks player needs to put his body between the point and the net. Nobody did.